All most in every application, report generation facility is there. So it is very important to test the report and verify the date present in Report. Report can contain anything. They can contain digit, character or both. Some time it also have graphs, charts etc. its useful data which can be helpful to take the decision on further improvement. 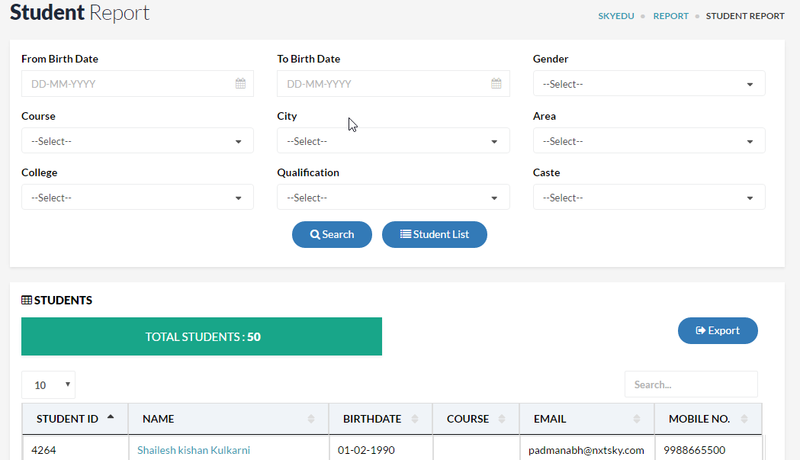 As you can see the image, there are lot of filters are present for this student report, user can search for birth date, gender, course, city , area , college, qualification and caste, and user even import them into the excel file using export button, and user even can try combination of filters. Which make tougher to validate the data. So to generate the report we need to provide inputs like date range, course etc. Once we provide the input and click on search then report get generated for that particular provided input. Let’s consider that, we have entered the city name as pune, after report generation check that all the entries present in the generated reports are from pune or not, check is there any other city present. 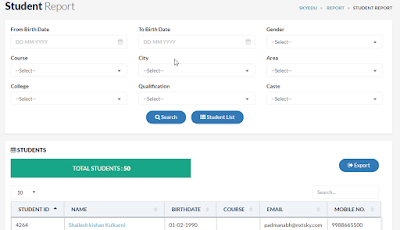 In similar way if we input the course name then check all the entries are of the course which we selected in the filters. The generated data might look correct but tester need to verify it with some source like there might be another screen where all the data present, just compare the data present in generated report with the data shown on another screen, if there are more than 100 entries in that we cannot check for each entry so we just need to check the count of entries with the another screen, and check starting entry, end entry and few in-between entries to make sure all the data is correct and presented in order. If there is some discrepancy between the records, or we might not sure about the authenticity of the other record screen then the best way is to query the database and verify report with the database to be sure. For that tester need to have some SQL knowledge so that he can verify the result. There some report where calculation is present in that case we may not get the calculated value in database so in that case we need to make it with the calculator and verify the result. for example, suppose there is a report which shows the fee collected in particular date range, mean we just need to give the date range and application would automatically calculate the amount received in that particular selected span. So in database we can only see the collected and date we will not get the calculation in database, so in such a situation we need calculate it manually. Tester need to check format of the repost, not only the data present in the report but how the report is shown, show the columns are represent in the report is also important, verify any missing column or any data might be shown in wrong column or there might be situation where end date is shown start date and start date is shown is end date, need to sure and need check each field and the date represent in columns. Also check the format in which report gets downloaded, whether its pdf, excel or doc, how it’s get printed on A4 size paper, this need to be tested as well. Tester also need to look for the time in which report get generated. If there is so much data then also it should not take much time. thanks for covering this topic.. It covers various aspects of the report testing.